Congratulations to new author Meg Medina, who is the 2012 winner of the Ezra Jack Keats New Writer Award for her children's picture book, Tía Isa Wants a Car. 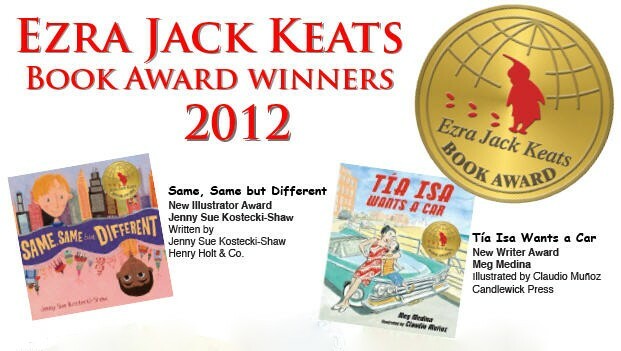 Every year, the Ezra Jack Keats Foundation presents the EJK Book Award to an outstanding new writer and illustrator of children's picture books. To be eligible, writers and illustrators must have published no more than three books. We are happy to see this year's Writer Award go to Meg Medina. We reviewed her book, Tía Isa Wants a Car on our sister blog, The Latin Baby Book Club last year. A Spanish version of her book, Tía Isa quiere un carro, has now been released...yay! !